Good friends, good cheer! It's the most wonderful time of year! 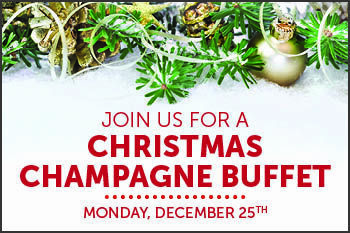 Create everlasting memories at our Christmas Day Champagne Buffet* with family and friends! - Chocolate Fountain and More! Plus! Bloody Mary Bar, Kid's Craft Station and Family Photos! *Buffet only, a la carte menu is not available. Advance deposit required to secure reservation. Reservation must be cancelled 24 hours prior or you will be charged the advanced deposit. Breakfast items served until 3pm.